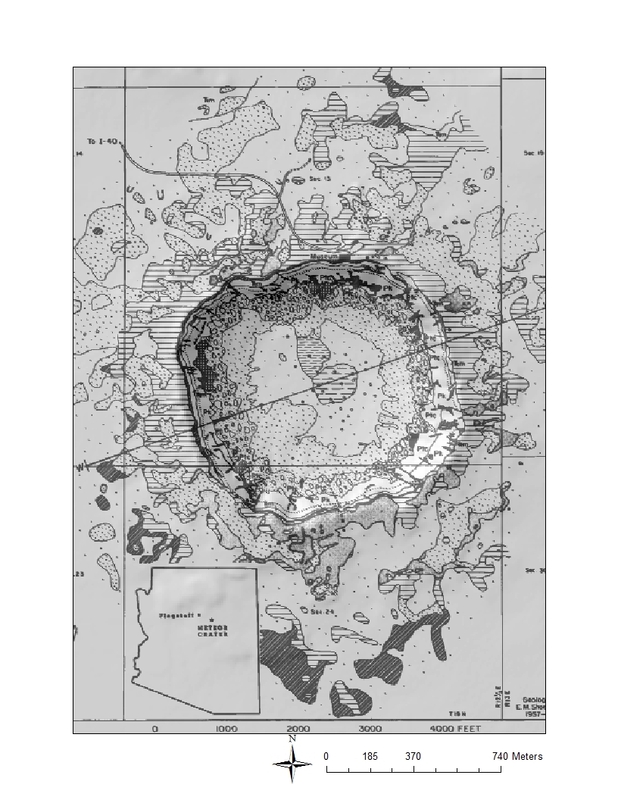 You just came back from field camp at Meteor Crater. Now that you have produced this beautiful piece of work you want to share it with everyone. 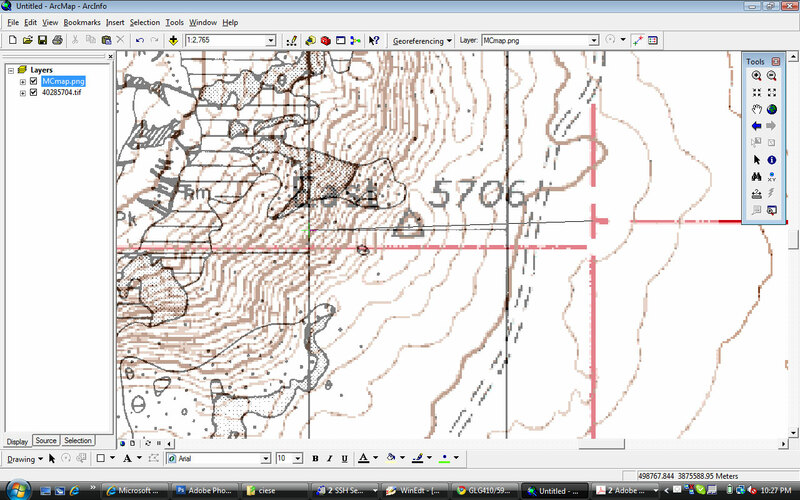 But only scanning it and putting on the web is not really satisfactory because it would be relatively hard to further work with the map. And even so it is a beauty of a map, the weeks you have been working on it in the field really show: It looks quite worn out. So what can you do? 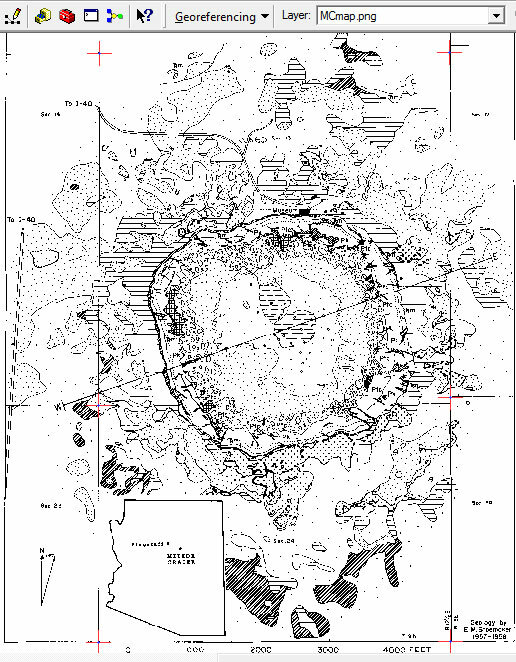 The answer is georeferencing and digitizing it. 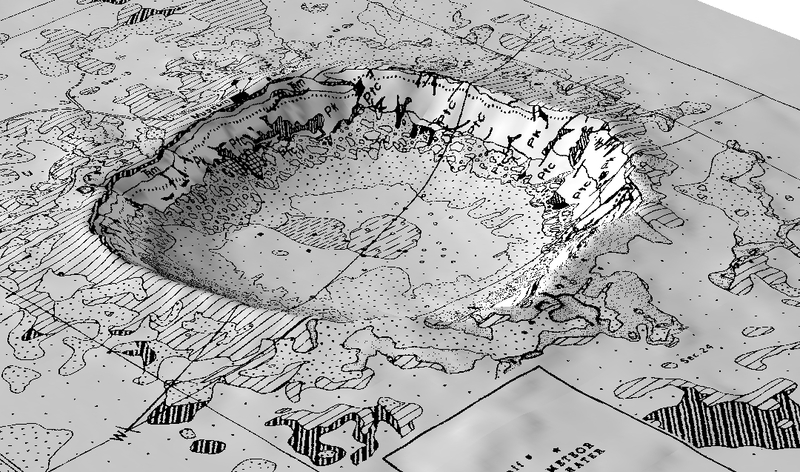 This allows you to easily overlay your map with other data and make even nicer maps. Here, we will describe briefly how to georeference (or rectify, the words are interchangeable) a map without spatial reference to a map that has some. 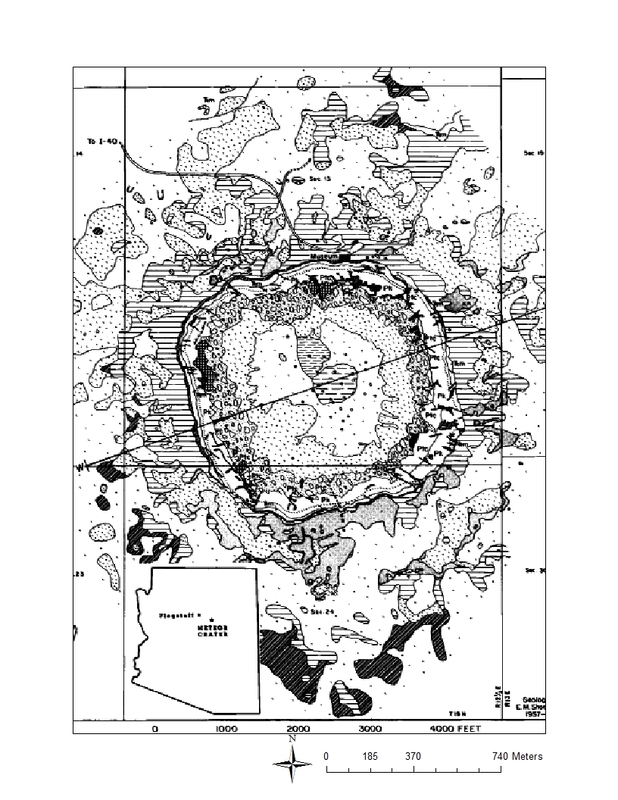 As an example we will georeference a geologic map of the Meteor Crater made by Gene Shoemaker. 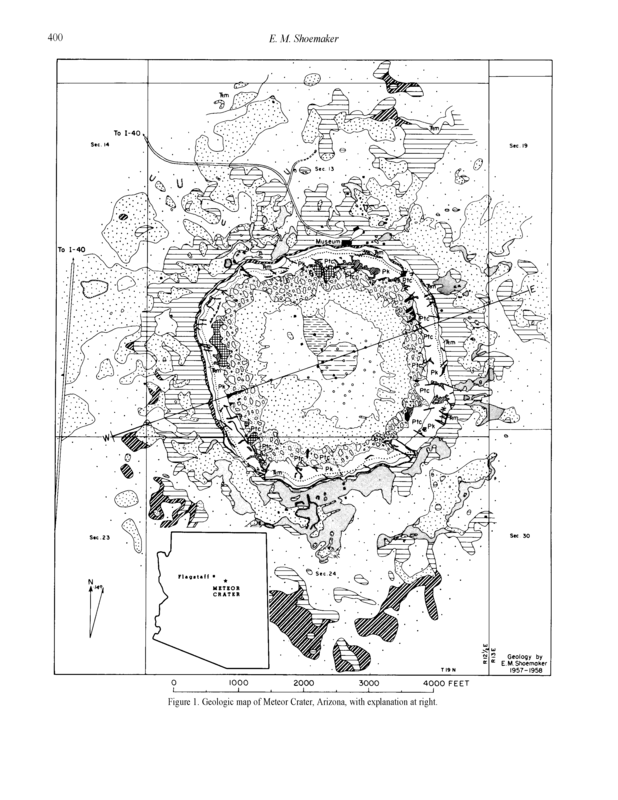 Here is a field guide for the site from the Geological Society of America: Shoemaker field guide. Here is the map exported from the pdf as a PNG file: MCmap.png. 1.) Download the data and put them all in one folder (e.g. /georef). When you unzip some of the files you will notice that for each *.tif there may be three other files (a *.txt and an *.aux and a *.rdd). They are made by Arc, do not delete or mess with them. 3.) Go to "add data" and add the DRG (it is a georeferenced tif). 5.) 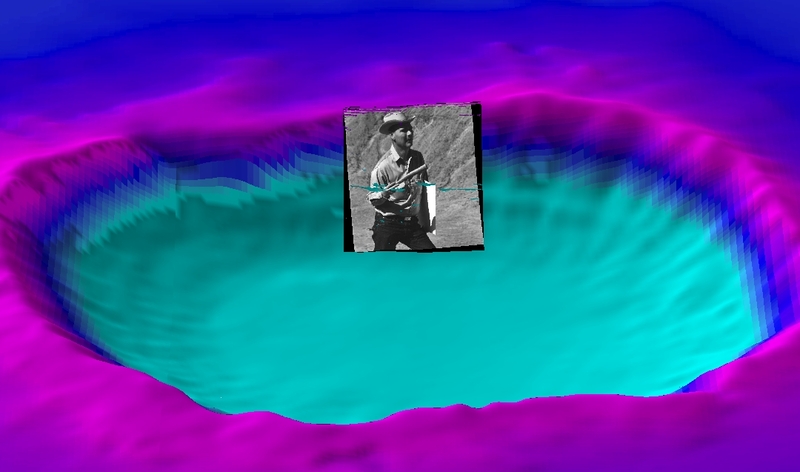 Go to "add data" again and add the unreferenced image/map. Answer the question about pyramid-building with yes and wait till it is done. 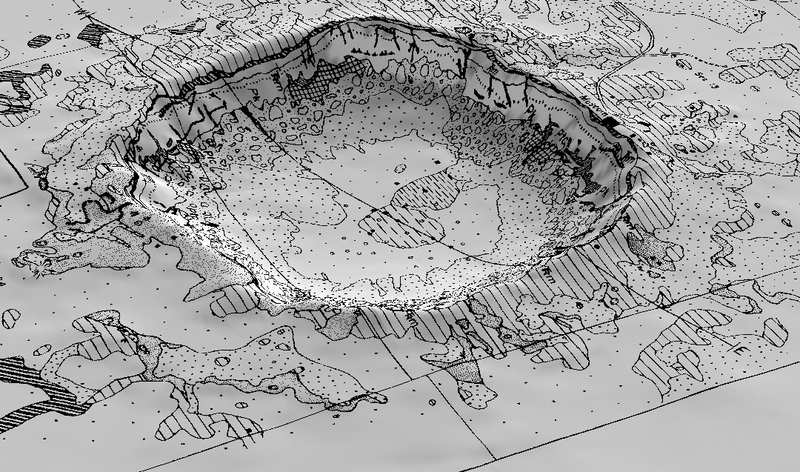 You will get a warning message that this image has no spatial reference (not yet!). Note that you won't see the map yet. 6.) 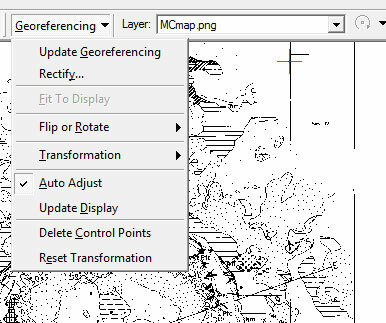 To do the georeferencing, we need the corresponding toolbar: View menu => Toolbars => Georeferencing Toolbar Select the unreferenced layer/file in the toolbar. 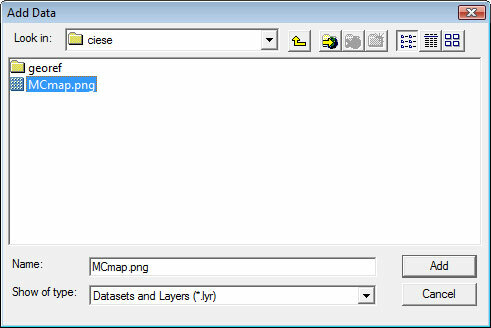 In this example that would be "MCmap.png". Note that you can use tiffs, jpgs, pngs, etc. image file formats here. 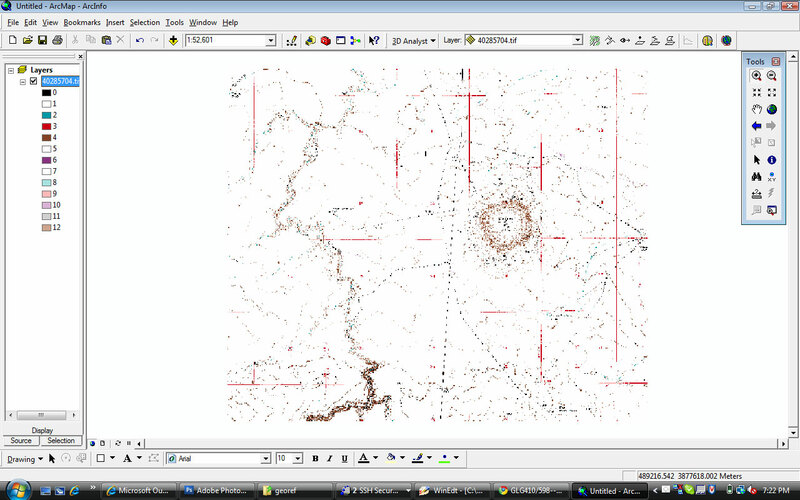 Once you are at approximately the same view scale and position as the map, select fit to display in the georeferencing tool pull down menu. 7.) 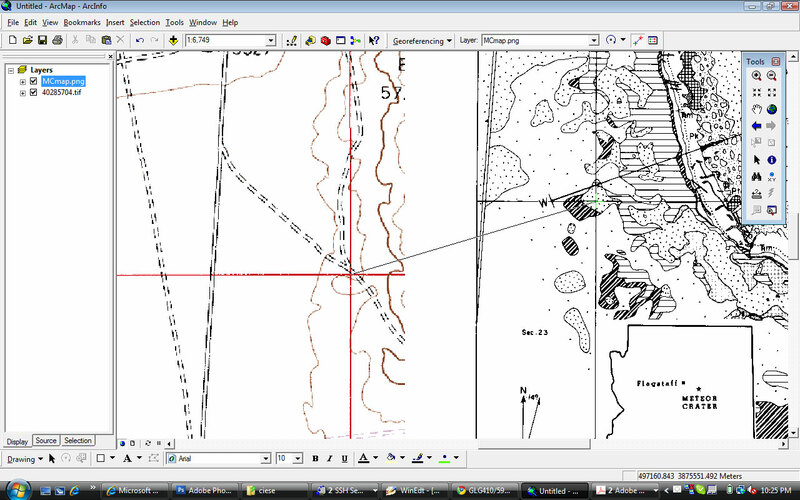 On the Georeferencing Toolbar select Add Control Points. i. Find and click on a location on your unreferenced image. ii. Find and click on the same location in the referenced basemap. THIS IS IMPORTANT! 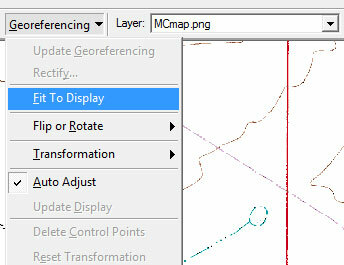 MAKE SURE THAT THE UNREFERENCED LAYER IS SELECTED IN THE GEOREFERENCING TOOLBAR! AND JUST AS IMPORTANT: WHEN DEFINING THE CONTROL POINTS, CLICK FIRST AT THE UNREFERENCED, AND THEN AT THE REFERENCED MAP!!! Find at least 3 other points, that match. You will probably see that the two dataset start to overlay each in a descent way when you have identified 4 or five points. Get a descend number of matching points. Make sure that they are distributed more or less evenly. Note how you can make the unreferenced map semi transparent, or simply select the point, then turn the layer off, then click on the target point on the georeferenced map. 8.) When you think you have enough points (e.g. several to 20) you can save the now rectified map. Go to Georeferencing Toolbar, click Georeferencing, update the georeferencing and after that click Rectify in the same menu. 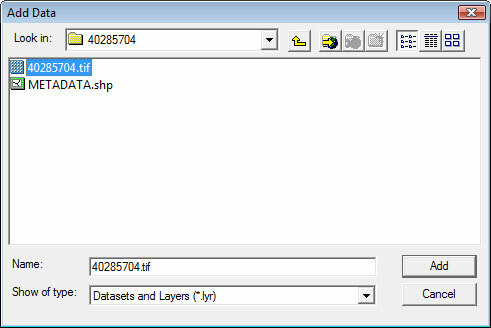 In the dialog that will open you can define the name of the georeferenced/rectified image. Now you can add the just saved, rectified image and remove the other layer.